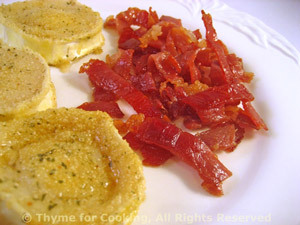 Baked Chevre with Prosciutto, Thyme for Cooking simple first course. These goat cheese rounds are often served on big, meal-sized salads for lunch at the small Bistros that are everywhere in France. Thinner slices, garnished with some crisp Prosciutto, make a simple starter. Mix bread crumbs and dry mustard. Put onto a plate and put 2 tsp olive oil on another plate. Dip both sides of the cheese into the oil, then the crumbs and place on a nonstick or lightly oiled baking sheet. Roughly chop the prosciutto and sauté in 1 tsp oil over medium high heat until they start to get crisp. When cheese is ready, add to plates and serve.